For anyone who breeds chameleons, it's important to recognize when your females are ready for mating. In literature sources, various ways are described to determine the receptivity of females. This is often based on coloration but is still very difficult to identify for sure in many species. The most information is present for Chamaeleo calyptratus and for most other species, it's more difficult. 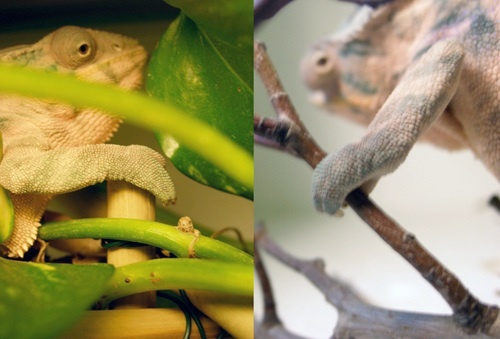 About five years ago I started to breed Furcifer pardalis. When discussing ways to determine receptive females, everyone told me to look at their colors. Receptive females should get nice soft colors and should not turn black or get aggressive towards the male when kept together. One way or the other, this did not seem to be the best way for me. The colors of the females where so variable that I often couldn't tell for sure if the females were receptive to mate. So I began trying to look for other signs of receptiveness. In the end, I noted some very logical observations. First off all, the color did indeed seem to not be the best way of determining receptiveness for me. A better way seemed to be paying attention to the feeding ritual of the females. They all had a period of fast growth until a size of 21-24cm total length when growth slowed. It was clear to me that in this phase, the first matting should occur. Unfortunately, I still couldn't tell the exact moment to mate my females so I tried to look for better signals of receptiveness. Finally I found one that seems so logical that I wondered why I hadn't seen it before. After a female mates, their pregnancy lasts for an average of 28 days. When laying their eggs they normally dig a hole of about 20-35cm deep. This digging costs them a significant amount of energy. 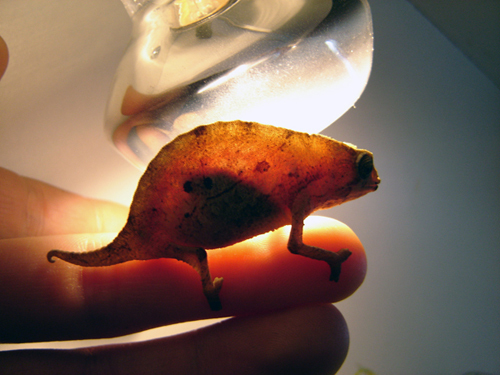 To me, it seemed that female Furcifer pardalis had developed their own tool to make this digging easier. Before they start digging their hole, the nails on their front legs appear to start growing to more then double the normal size. This seems to be a very logical occurrence as these long nails would make the digging much easier. The most beautiful part of this is that the growth of their nails seems to start at the onset of receptivity. After laying their eggs, their nails got shorter again and before the next mating they once again started to grow. Thus far all my pardalis females have shown this nail growth (15 different females). Female F. pardalis prior to nail growth. Photo courtesy of Guido van Lier. Female F. pardalis showing nail growth. Photo courtesy of Guido van Lier. Many breeders speak of letting their females become 12-15 months of age before the first mating but this doesn't match with my experiences. In the winter of 2004 I tried to get females to this age before mating the first time. I saw in several cases that they became receptive and their nails started to grow. Regardless, I didn't let them mate but found that they produced infertile clutches regardless. After this I decided not to wait with mating them when they are show clear signs of receptiveness. In addition to this experience with F. pardalis I was interested in whether this also occurred with other species of chameleons. I also kept some Furcifer oustaleti at the time consisting of wild caught specimens as well as their offspring. The wild caught female seemed to also show long nails and later when my offspring female started getting bigger I hoped she also would show her receptive signs. Indeed she did and besides some obvious colors on her head, her nails started to grow really fast. At that time, mating occurred without a problem, while prior to that time, it hadn't occurred. Besides F. pardalis and F. oustaleti I don't have any experience with other animals from the genus Furcifer but I expect that more species from this genus will show similar signals. Within the genus Chamaeleo, I haven't been able to detect such signals but I hope in the future to try to find if they give any such indications. For me this is a significantly easier method to see if my females are receptive. Colors and feeding patterns also tell a lot and they're often correct but in my experience are not as accurate as the growth of the nails. When I wanted to buy my first Rhampholeons, now about five years ago, I noticed something funny about them. The animals I was planning to buy were kept in a small terrarium with a regular spot. When getting one of the animals out of this terrarium I thought I saw something strange and kept him still. At this moment I noticed this little animal seemed to be transparent. Of course they are not transparent but when you keep them under a bright light you can see all their organs. You won't actually see very much. When you look at their body (excluding their head and legs) you'll see a small part that's completely black-about 10-15 %. The remaining 85-90% seems to be transparent. It appears bright and when you run something solid behind the animal you'll see it as a black spot. The black part you see represents almost all organs from the animal. Gravid female Rhampholeon temporalis. Photo courtesy of Ferdy Timmerman. To this point, I found two major benefits-both regarding the health of your animals. The first advantage is you can see if the animals suffer from filarial worms. With wild caught animals in a shop, it's often hard to see these worms. But when you move a Rhampholeon into the light, you can see them really easy. They exist thru the whole body so when you see some black stripes moving in the sections that are normally 'transparent' you might be seeing worms. People with weak stomachs might be advised not to watch as you can really see them move around in the body of these little animals. Often you can see as many as ten or more in one animal. When you find an animal with such filarial infestations, there's a good chance that the other chameleons in that cage could suffer from them and you may decide to be careful about buying such animals. An additional advantage is that you can see if females is gravid, and in which stage. Normally 10-25% of the body will be opaque but with pregnant animals, this will be 25-50%. At close to 50% you might also be able to recognize the form of the eggs. In the beginning, it may be hard to tell the difference but when you've seen several animals it's quite easy. As with all chameleons, pregnancy can bring a lot of stress for the animal. When a WC female is in the final stages of her pregnancy, there is a good chance that all the traveling will have put an extreme amount of stress on her. Obviously then, it can be useful in avoiding specimens that may be prone to oviposition issues or damaged eggs. Further, when a female with significantly higher than normal opaque portions are encountered, it may indicate a female with a high risk of dying due egg binding. Large clutch sizes can easily increase the energy needed to safely lay the clutch successful and as such, unusually large clutches are a risk. If you wish to buy a pregnant female, obviously it may be advantageous to buy one where the black part is not excessively abundant. When you are planning to buy new Rhampholeons, you might try to have a close look at the animals. With this information, you have a bigger chance of buying healthy animals. When you see anything strange inside them, it may be an indication that you will want to move on. Hopefully this will help some people and increase your chances of buying healthy specimens.